The spine is made up of bones called vertebrae. At the front of the spine is solid bone, and at the back there is a bony canal, or channel called the spinal canal. The spinal canal contains a fluid-filled tube extending from the base of the skull to the tailbone. This is called the thecal sac and the fluid is called cerebrospinal fluid (CSF). The spinal cord and nerves to the body are contained in this CSF filled sac. A puncture is made into the thecal sac with a spinal needle and a water-soluble contrast medium (sometimes referred to as a contrast agent or X-ray ‘dye’) is injected into the sac. Contrast medium is used in medical X-ray imaging to show the inside of the body on an image or picture. This procedure is referred to as myelogram. A puncture of the thecal sac is called a lumbar puncture. People who cannot have MRI of the spine because they have a pacemaker or other metallic implants. New pacemakers, called ‘conditional’ pacemakers, can allow MRI of some parts of the body that are a long way from the pacemaker, such as the knee, ankle or head. MRI of the spine is generally not permissible even with this type of pacemaker, as your chest and the pacemaker in your chest need to go into the scanner, and this can stop the pacemaker working properly. To show whether there is leakage of CSF from the thecal sac around the spinal cord and nerves. People who have this can experience dripping of spinal fluid from the nose, meningitis (often multiple attacks over months or years) or severe headaches that get worse with standing and are relieved when lying down. You should wear comfortable clothes that are easy to remove and leave jewellery at home Please note that some of the disinfectant agents used during these procedures may stain light-coloured clothing. When you make your appointment for the myelogram, you need to let the radiology clinic or department know if you are taking any blood thinning medication, such as warfarin, clopidogrel, dabigatran, prasugrel, dipyridamole or asasantin (for more information about these medications, go to NPS: www.nps.org.au/medicines). Blood thinning medications may need to be stopped for a period of days, or your normal dose reduced, before this procedure is carried out. It is very important that you do not stop any of these medications or change the dose without consulting both the radiology clinic or department and your own doctor. They will give you specific instructions about when to stop and restart the medication. These drugs are usually prescribed to prevent stroke or heart attack, so it is very important that you do not stop taking them without being instructed to do so by your doctor or the radiology practice, or both. Aspirin is usually not stopped. A blood test may be required to check your blood clotting on the day of the procedure. Continue with pain medication and other medications as usual. You will be asked to change into a hospital gown in a changing room, and someone will look after your clothes and valuables during the procedure. You will be taken into the room where the procedure is carried out, called a fluoroscopy suite. You will be asked to lie on your stomach on the fluoroscopy table, which is covered with a thin foam mattress and you may have a pillow under your stomach. The table has an X-ray machine under it and a screen over the top of it, as well as a television screen where images or pictures of the inside the body can be viewed directly by the radiologist carrying out the procedure (while the procedure is being carried out). Your lower back will be cleaned with antiseptic fluid, which is usually very cold, and draped with sterile towels. Local anaesthetic is injected through a small needle in the middle of your lower back. This will numb the skin and deeper tissues. This is uncomfortable for a few seconds, producing a pin prick and a stinging sensation. You will be awake and only the area where the myelogram is being carried out will be numb. When the skin and muscles are numb, a thin spinal needle is guided into the bony spinal canal and it then punctures the thecal sac. Spinal fluid comes out of the needle and shows the doctor that the needle is in the thecal sac. The X-ray machine will be used to guide the radiologist locating the place for the injection and passing the needle into this spot. Iodine containing contrast medium, usually approximately 10 mL, is then injected into the fluid around the spinal cord. The table may be tipped a little so that your feet are a bit lower than your head when the contrast is injected to make the contrast run downwards into the lower back if you have lower back problems. The needle used to inject the contrast is then removed and a number of X-rays are taken. You will be asked to roll slightly onto each side, onto your back, and to stand while these pictures are taken. The table may also be tipped so that your head is lower than your feet in order to make the contrast that has been injected run upwards into your neck or into your head. This is commonly done if you have neck problems or a question of leakage of CSF into your nose. You may then be transferred to a room where there is a computed tomography (CT) scanner and asked to lie on the table, either on your back or stomach, and further pictures of the spine will be taken using the CT scanner. On rare occasions, the spinal needle puncture will be carried out on your neck if lumbar (lower back) puncture is not possible or prevented by skin infection or dressings on the skin of your lower back. Are there any after effects of a myelogram? Headache is the major after effect. It can be quite severe, but fortunately is relatively short-term for most people. It is minimised by bed rest for 24 hours and having plenty of fluids to drink. Any back pain you already have may be made worse by the extra pressure of the injected fluid. The fluid is absorbed by the body over the few hours after the myelogram, and the extra pain decreases when this happens. Sometimes it can be hard to get the needle into the fluid sac and the myelogram cannot be done. This is often the case in people with severe narrowing in the bony spinal canal as a result of arthritis and disc disease. How long does a myelogram take? The time varies depending on the area to be examined. If the procedure is being carried out on your lower back (the most common area), it will take approximately 30 minutes. If the procedure is being carried out on your lower back and neck, it will take approximately 45 minutes. The CT scan is usually carried out approximately 15 minutes after the myelogram and X-ray images are taken, and takes approximately another 15 minutes. Myelography is a very safe procedure with minimal possible risks. Nerve injury. 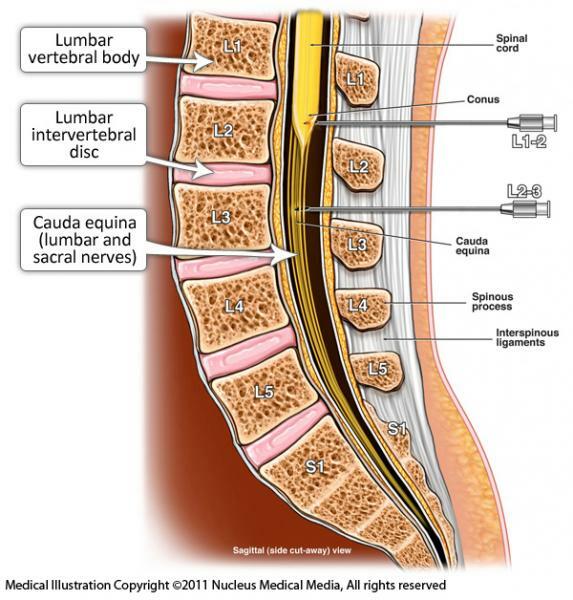 Nerve injury occurring at the time of the lumbar puncture can result in shooting pain into the buttocks or down the leg and may persist as a dull ache or resolve over days to weeks. Bleeding around the fluid sac. Bleeding into the space around the fluid sac is uncommon, but can produce weakness in one or both legs, persistent back pain and, more rarely, problems with emptying the bladder. This is more common if you are on blood thinning medications, so it is very important to follow instructions that are given to you about stopping these medications before the procedure. Surgery on the back is necessary to treat major bleeding that causes leg weakness or bladder problems after a myelogram. Bleeding into the space around the fluid sac that is enough to cause permanent weakness in the legs is very rare (less than 1 in 1000 myelograms), especially if you do not take any blood thinning medication. Prolonged leakage of fluid from the puncture site. Prolonged leakage of fluid from the puncture site can produce a headache that may last for more than a couple of days. If this does not resolve by itself, a procedure called a ‘blood patch’ can help. This is carried out by a radiologist and involves injecting a small amount of your own blood where the lumbar puncture needle went in. The blood seals off the leak, which stops the headache. Meningitis. Infective meningitis (as a result of bacteria) or a more common and mild condition called sterile meningitis (as a result of putting a needle and contrast into the fluid sac) can occur after a myelogram. These cause a prolonged headache, fever in some cases and neck stiffness, as well as feeling generally unwell. Infective meningitis is very rare when proper sterile techniques are used for myelography. Epileptic seizure. Epileptic seizure is a very rare event that can occur as a reaction to the iodine contrast medium that is injected. If it is going to occur, it generally happens within hours of the procedure. Allergic reaction. Allergic reaction to the iodine contrast medium is rare, but possible as for intravenous injections. If you know you are allergic to contrast medium, you must tell the staff at the radiology practice when you make the appointment and again when you have the myelogram. You will require special preparation with corticosteroid medication a day before the myelogram if you have had a previous allergic reaction to contrast medium. What are the benefits of a myelogram? Myelography can be very helpful for diagnosis and management of acute or chronic spinal problems, and diagnosis of CSF leakage. The myelogram will be carried out by a radiologist, trained in carrying out radiology procedures and interpreting X-ray images. The radiologist will be assisted by the radiographer, who is the technician who operates the X-ray machine while the procedure is carried out and the CT scan afterwards. Where is a myelogram done? A myelogram is usually carried out in a private radiology practice or hospital radiology department equipped with X-ray screening where there is fluoroscopy available and a CT scanner. Fluoroscopy equipment is where the X-ray images can be watched on a TV screen as the procedure is being carried out. When can I expect the results of my myelogram? American patient information site developed by the American College of Radiologists (ACR) and the Radiological Society of North America (RSNA).